Citation: Ngonso BF, Egielewa PE, Nyong AE. Influence of Interactive Media on Communication Education in Nigeria: A Study of the Use of Power Point in Teaching Mass Communication. Global Media Journal 2018, 16:31. There has been a great concern in Nigerian Universities on how to ensure that her graduates are able to successfully meet the cultural, economic, scientific and technological challenges of the modern society. Other concerns are that Nigerian Universities are often plagued with strike actions from the teaching staff and the non-teaching staff unions leading to malfunctioning of the entire educational system in Nigeria. Other serious problems often encountered in the University System in Nigeria is the inability of the existing 160 universities to provide space for prospective candidates, infrastructural decay and absence of modern teaching and instructional materials such as smart boards and mobile technologies in spite of the huge benefits to educational system. While universities in the developed climes are already using interactive media to teach students different subjects, in Nigeria there seems to be no idea about the use of interactive media in lecture delivery. Many universities still adopt the traditional method of writing on the black board with chalk or white marker board with colored marker. With this scenario, many Nigerian students are not so much aware of the importance of receiving lectures through the aid of multi-media facilities. This calls for a change in the concept of knowledge acquisition, teaching and learning processes and skills development. Older and new generation universities in Nigeria are now making efforts to catch up with this current trend of using multi-media facilities such as smart board and mobile technologies in teaching and learning. Zohar  stresses the need for today graduates to develop high ordered thinking skills, ability for independent learning and to make judgment. It is also expected of them to develop skills for creative and critical thinking. It is equally believed that modern teaching materials or facilities aid the students to understand the subject faster. However, the effectiveness of instructional materials and strategies depends upon the manner and degree to which they meet the needs of the teacher and students. Instructional strategies and materials are selected based on the principles of provision of accurate materials that will enrich and support the curriculum, taking into consideration the interest, abilities and maturity levels of the students. Teaching brings about understanding; it involves a teacher, a learner and subject matter and teaching materials. Therefore, to bring about learning, the teacher engages in certain activities such as talking, demonstration, and giving instructions. All these are the various strategies to bring about learning . Teachers need to use different instructional materials and strategies to ensure students centered method in the classroom for creativity, innovative and critical thinking purpose in students. Classroom teaching is likely to be more effective when it is informed by an understanding of how students learn. It is therefore important that, the major implications of instructional strategies be reflected in classroom practice. It is in the view of this that this study seeks to investigate the use of interactive media as instructional materials in teaching and learning Mass Communication in Cross River State University of Science and Technology. Humans advance with technological innovation even in the educational sector. The use of interactive media for instructional education cannot be neglected, as schools have started embarking on the use of different interact media forms such as smart board and mobile device for learning. In Nigeria the use of Microsoft PowerPoint has become obvious at conferences, workshops and symposia, but it is not clear whether various disciplines in the Nigerian Universities use this form of media or other forms for teaching and learning especially in Mass Communication Departments. This study hopes to ascertain whether or not Departments of Mass Communication use interactive media, particularly the use of Microsoft PowerPoint in teaching and learning processes and to also determine the extent of utilization of the interactive media in communication education. • To determine the extent of utilization of interactive media in communication education in Mass Communication. • To find out whether these interactive media are effective instructional tools in communication education. • To find out possible challenges facing the use of interactive media for communication education. • Are these interactive media effective instructional tools in communication education? • What are the possible challenges facing the use of interactive media in teaching and learning Mass Communication? HO1: There is no relationship between student’s comprehension of communication studies and the use of interactive media. HO2: There is no relationship between effective teaching of mass communication and the use of interactive media. This study would contribute to existing literature in ICT and new media studies and communication education generally. The study would also provide data for those who are interested in ICT and knowledge acquisition and who may want to embark on similar study. It would provide useful materials for mass communication teachers and students who may not have full grasp of the usefulness and benefits of the ICT in teaching and learning processes in the field of Mass Communication. In addition, the findings and empirical literature would provide insight to the use and extent of utilization of interactive media in communication education in Nigeria. Interactive media is used as an essential tool for learning in some Nigerian tertiary institutions. It is no more news that technology helps in making learning easier, faster, and even more comfortable. While research on this is at a preliminary stage in Nigeria, it is possible to say that the introduction of multimedia into the classroom has a profound impact on styles of teaching and learning. Students are seen to be more motivated when using multimedia. Teachers also have confirmed that multimedia enables student-teacher interaction. Increase students’ participation in class due to visual impact of the multi-media teaching facilities, and motivate learning cooperation amongst students. The teacher becomes a facilitator, problem setter and guide as opposed to taking a central role. Lectures become more of sharing rather than linear dissemination of ideas. Indeed, the computer competence of some students enables them to navigate through imaginatively while taking their lectures. Managing the introduction of multimedia into the lesson is also interesting in the sense that teachers taught with visual demonstrations. Everything said by the teacher is seen on the screen by the students. Students being taught this way are more likely to develop interest in the course than those taught with the traditional methods of writing on the board. The use of interactive media is being fast adopted in most tertiary institutions in the developed world as it makes teaching convenient for the lecturers. Microsoft PowerPoint is the most commonly used so far. In Nigeria there are no empirical works or data that show the number of universities that use Power point on smart boards to teach. PowerPoint is part of the Information and Communications Technology (ICT) programme developed by Microsoft in 1987. It is an application programme of presentation bundled in Microsoft office . It consists of slides allowing the user to present messages . Information prepared on a computer could be better projected for larger audience using a Liquid Crystal Display (LCD) or DLP projector. PowerPoint presentation could be used in the classroom for supporting student learning by combining computer and projector to display slides for illustrating a lesson. Potentials of Microsoft PowerPoint include: its ability to do spell check, allowing the user to add, correct, make changes to the lessons, and use printout materials for students’ personal use also post and share slides on social media platform such as WhatsApp group and also use online and inbuilt graphics for explanations. PowerPoint gives the user the opportunity to incorporate visual and auditory aspects to a presentation. It permit variety of manipulations by editing or text modification, removal of existing slides and addition of new slides to make lesson more organized and flexible. PowerPoint presentations can be regarded as a good instructional medium and a key for facilitating an effective teaching-learning process. Microsoft Power point carries with it clamour because of the use of animations, transitions, design, and slide show. These attributes give power point projection a kind of TV influence which allows students to enjoy what is displayed on the screen. Though Nigeria is a developing country and as such, the educational sector is still undergoing development. The use of interactive media is not very rampant amongst tertiary institutions particularly the old generation universities in Nigeria but the minds of students and lecturers are open to drastic educational technological development particularly in the new generation universities where much emphasis is laid on computer literacy. While some of these new generation universities have and use multimedia facilities others in this category are only theorizing. However, without empirical studies we rely on personal contact to say that Covenant University, Edo University Iyamho, University of Uyo (Medical School) University of Ibadan and Gregory University use interactive media to deliver lectures. While this few we are sure, we are not certain about others. In spite of the efforts made to fully utilized multimedia facilities in teaching and learning processes, the major challenge faced in the use of interactive media is the problem of inadequate power supply, lecturers’ slow nature to innovation; lacking the ability to use computers while some of the lectures are carried away by "spoon-feeding" dilemma, believing that multimedia provide students with spoon-fed education. A study conducted by Chang, et al. investigated the effects of multimedia applications on 7th graders’ performance in science class. The study focused on three different groups of students and concluded that learning was more effective in the group taught with multimedia applications. In their study on learning physics. Günel, et al. stated, that the group presented with multimedia applications was more successful than the groups taught with traditional methods. Gier and Kreiner  who studied the effectiveness of PowerPoint in a psychology class concluded that when students were actively engaged in the class using PowerPoint presentation, information retention increased. However, Daniels  studied the effectiveness of PowerPoint in a college level economics class and found no significant difference in student performance. This theory argues that new technology influences the way we do things. However, innovations are not easily adopted by all individuals in a social system at the same time. Instead, they tend to adopt in a time sequence, and can be classified into adopter categories based upon how long it takes for them to begin using the new idea. This theory argues that technology shapes how individuals in the society do things. This theory is believed to be relevant to this work because today’s society is driven by basically media technologies. No organization in today’s society ignores the use of information and communication technology. Practically speaking, this theory believes in change driven by technology. • What is the extent of utilization of interactive media in communication education in you Department? • What are the possible challenges facing the use of interactive media in teaching and learning mass communication? 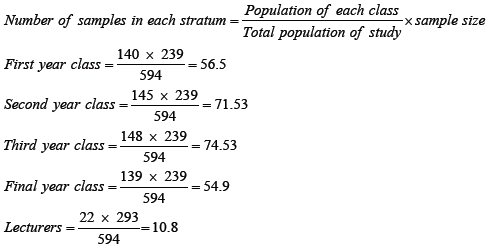 (Table 1 and Figure 1). Figure 1: Extent to which interactive media is being used in respondent’s department. 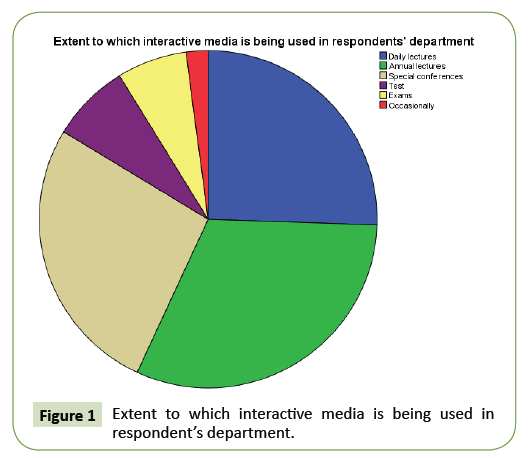 Table 1: Extent to which interactive media is being used in respondents' Department. The table and chat above show that 61 respondents (25.5%) use interactive media in their daily lectures in their Department, 75 respondents (31.4%) use interactive media in annual lectures in their Department, 64 respondents (26.8%) use interactive media only for special conferences in their Department, 18 respondents (7.5%) use interactive media only for tests in the Department, 16 respondents (6.7%) only use interactive media for exams in the Department and 5 respondents (2.1%) use interactive media occasionally in the Department. The analysis shows that interactive media is used more in annual lectures (Table 2 and Figure 2). 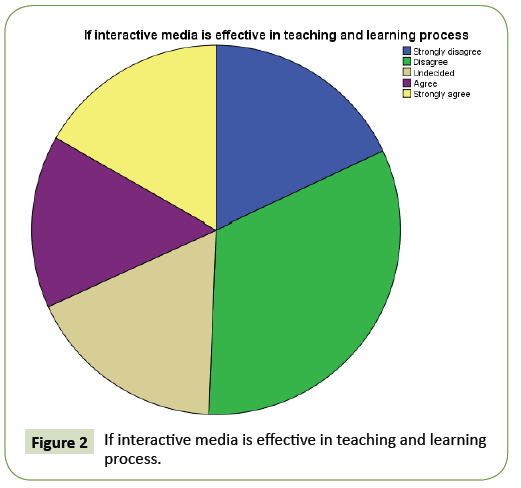 Figure 2: If interactive media is effective in teaching and learning process. Table 2: If interactive media is effective in teaching and learning process. The table and chat above show that 43 respondents (18.0%) strongly disagree with the assertion that interactive media is effective in teaching and learning, 78 respondents (32.6%) disagree with the assertion, 42 respondents (17.6%) were undecided of the assertion, 36 respondents (15.1%) agree with the assertion while 40 respondents (16.7%) strongly agree with the assertion that interactive media is effective in teaching and learning. The analysis shows that more respondents disagreed with interactive media being effective in teaching and learning (Table 3 and Figure 3). 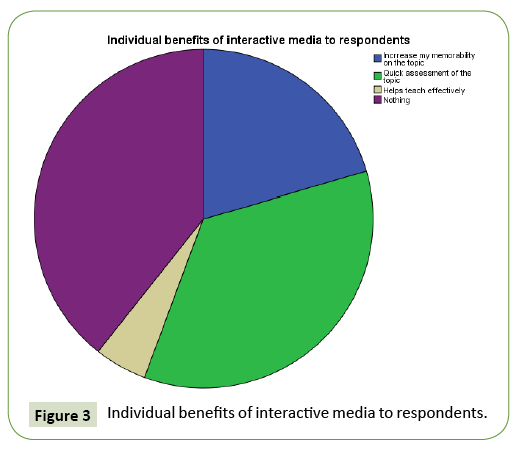 Figure 3: Individual benefits of interactive media to respondents. Table 3: Individual benefits of interactive media to respondents. The table and chat above show that 49 respondents (20.5%) were in the view that interactive media increase their memorability on the topic, 84 respondents (35.1%) were of the view that it help them with quick assessment of the topic, 12 respondents (50.0%) were of the view that it help them teach effectively and 94 respondents (39.3%) were of the view that interactive media is not beneficial to them. This analysis shows that more of the respondents are of the view that interactive media help them with quick assessment of the topic being taught (Table 4 and Figure 4). Figure 4: Likely challenges faced with the use of interactive media. Table 4: Likely challenges faced with the use of interactive media. The table and chat above show that 143 respondents (59.8%) were of the view that power failure is the main challenge faced with the use of interactive media, 48 respondents (20.1%) were of the view that unavailability of equipment is the main challenge faced with the use of interactive media and 48 respondents (20.1%) were of the view that people’s inability to use interactive media is the main challenge faced in the use of interactive media. This analysis shows that more of the respondents are of the view that power failure is the main challenge faced in the use of interactive media. The hypotheses for this study were tested using Pearson correlation. The level of significance was 0.05. HI: There is a significant relationship between students’ comprehension of communication studies and the use of interactive media. HO: There is no significant relationship between students’ comprehension of communication studies and the use of interactive media (Table 5). Do respondents' department use interactive media? The p value is 0.9. This indicates that there is a significant relationship between students’ assimilation of communication studies and the use of interactive media. Therefore, we will accept the alternate hypothesis. H1: There is a significant relationship between effective teaching of mass communication and the use of interactive media. Ho: There is no significant relationship between effective teaching of mass communication and the use of the interactive media (Table 5). The p value is 0.9. This indicates that there is a significant relationship between effective teaching of mass communication and the use of interactive media. Therefore, we accept the alternate hypothesis. What is the extent of utilization of interactive media in communication education? To answer this question, responses on Table 1 were used. The responses revealed that 61 respondents (25.5%) use interactive media in their daily lectures in the Department, 75 respondents (31.4%) use interactive media in annual lectures in their Department, 64 respondents (26.8%) use interactive media only for special conferences in their Department, 18 respondents (7.5%) use interactive media only for tests in their Department, 16 respondents (6.7%) only use interactive media for exams in their Department and 5 respondents (2.1%) use interactive media occasionally in their Department. The analysis shows that interactive media is used more in annual lectures. Are these interactive media effective instructional tools in communication education in your Department? To answer this question, responses on Table 2 were used. The data revealed that 43 respondents (18.0%) strongly disagreed with the assertion that interactive media are effective in teaching and learning, 78 respondents (32.6%) disagreed with the assertion, 42 respondents (17.6%) were undecided of the assertion, 36 respondents (15.1%) agreed with the assertion while 40 respondents (16.7%) strongly agreed with the assertion that interactive media are effective in teaching and learning. The analysis shows that more respondents disagreed with interactive media being effective in teaching and learning. What are the possible challenges faced in the use of interactive media in teaching and learning mass communication? In response to this question, responses on Table 4 were used. The findings revealed that 143 respondents (59.8%) were of the view that power failure is the main challenge faced with the use of interactive media, 48 respondents (20.1%) were of the view that unavailability of equipment is the main challenge faced with the use of interactive media and 48 respondents (20.1%) were in the view that people’s inability to use interactive media is the main challenge faced in the use of interactive media. This analysis shows that more of the respondents are in the view that power failure is the main challenge faced in the use of interactive media. The main objective of this study was to determine the “the influence of interactive media on instructional education in Nigeria using Mass Communication Department, Cross River State University as case study. The survey research design was adopted using the questionnaire for the gathering of data, following the analysis of data and discussion of findings. This study is summarized thus: The findings showed that 98(41%) of the respondents are exposed to interactive media. Mass communication students in CRUTECH do not often use interactive media for lectures, though the tested hypotheses indicate that there is a significant relationship between effective teaching of mass communication and the use of interactive media and also indicate that there is a significant relationship between students’ assimilation of communication studies and the use of interactive media. This result may actually come from the little experience got from the use of the facility. Respondents also think the biggest challenge associated with the use of interactive media is the problem of power failure. This study revealed that the students and lecturers of Mass communication, Cross River State University of Technology (CRUTECH) are aware of the existence of interactive media but are unable to explore the full potential due to power problem and irregular use of the equipment by lecturers. However, the tested hypotheses indicate that there is a significant relationship between effective teaching of mass communication and the use of interactive media and also indicate that there is a significant relationship between students’ assimilation of communication studies and the use of interactive media. • Multi-media should be made available and adequate power supply to power the system. • There should be enlightenment on the importance of interactive media for teaching and learning in tertiary institutions. These facilities should be made available in all Mass Communication Departments for effective communication education. Students and lecturers should always have their minds ready for new ideas. Zohar A (2010) Pedagogical horizons for learning. Paper presented during the 2011 Mashhad Training Programme. State of Israel Ministry of Foreign Affairs. Adeniran AA (2014) Students centered teaching methods and utilization of instructional strategies for effective social studies teaching. Paper presented at the 58th World Assembly of the International Council on Education for Teachers (ICET) at the University of Ontario Institute of Technology, Oshacma, Ontanio, Canada. El-Ikhan KK (2010) The advantages and disadvantages of teaching with PowerPoint. Asogwa UD (2011) Effect of PowerPoint presentations on secondary school student’s achievement in Christian religious knowledge. International Journal of Education Research V: 2. Chang, Quintana, Krajcik (2010) The place of multimedia in education. 6: 101-106. Hand G, Gündüz (2006) Groups presented with multimedia applications are more successful than the groups taught with traditional methods. Journal of Physics and the Masses 18: 215-219. Gier VS, Kreiner DS (2009) Incorporating active learning with PowerPoint-based lectures using content based questions. Journal of Teaching Psychology 36: 134-139. Daniels L (1999) Introducing technology in the classroom: PowerPoint as a first step. Journal of Computing in Higher Education 10: 42-56.